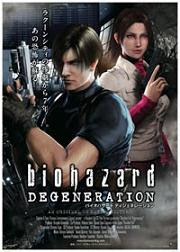 Resident Evil: Degeneration, known in Japan as Biohazard: Degeneration, is the first full-length Japanese CG animation feature based upon Capcom's Resident Evil video game series. It was announced by Capcom and Sony Pictures Entertainment Japan on October 29, 2007. Unlike the previous Resident Evil film trilogy, Degeneration is set within the same universe as the original video games. The main characters are Leon S. Kennedy and Claire Redfield, who appear together for the first time since Resident Evil 2. Claire Redfield is now a member of TerraSave, an organization which handles search and rescue at chemical and biological attacks. Claire arrives at Harvardville Airport to meet a family she is aiding. A passenger aircraft is approaching the airport to land. As one of the attendants checks the passengers, she notices one man looking unwell. The man in question is clearly in the final stages of t-virus infection, and warns the attendant. Shortly after, he zombifies. Claire is looking after her friend's niece, Rani Chawla, when they see Senator Ron Davis walk by. A zombie-masked protester is arrested by a police officer, only to be attacked by an actual zombie seconds later. One of Davis' bodyguards shoots the zombie while being attacked by the infected security guard, who was presumed to be dead. The second guard attempts to run but is also devoured. The scene causes panic and people in the vicinity flee, some being attacked by zombies. The plane shown previously crashes into the building, with all of the occupants already transformed into zombies. Claire, Davis and Rani hide in the VIP lounge. At night, the airport has been locked down by the United States Army and local law enforcement. Survivors are evacuated for treatment, many still locked inside the airport. Two Special Response Team (SRT) officers, Angela Miller and Greg Glenn are joined by a government agent with experience of such incidents, Leon S. Kennedy. The group enter the building through the roof and begin their search. They manage to find Claire and the survivors. Travelling back to the main terminal, Glenn is bitten by a zombie and stays behind, determined to save the rest by killing the creatures nearby. The survivors shoot their way out, with the soldiers (who had been vaccinated prior to the lockdown) clearing out the terminal. Claire, upon being told that the WilPharma Corporation, who she was campaigning against, had created a t-virus vaccine, realizes that the vaccine could have saved those who died. Suddenly, the WilPharma trucks containing the vaccine are destroyed. Claire goes with WilPharma worker Frederic Downing to the WilPharma research facility for more vaccine. After a tour of the facility, Claire is shown a molecular-scale image of the G-virus. She is left alone in the room as Downing heads for the sample. Claire calls Leon to update him about WilPharma's possession of the G-virus, and learns that he and Angela Miller discover Curtis Miller's house burnt to the ground. Downing phones Claire to warn her that a man has just left the facility and that a time bomb has been activated. Claire looks out of a window and sees Curtis Miller running through the central gardens with a briefcase. The bomb goes off. Leon and Angela arrive and Leon goes upstairs to Claire while Angela monitors the ground level. While Leon is upstairs, Curtis arrives at the garden. Not having much time left, he tells Angela that the government covered up some of the events in Raccoon City which kept his family from being saved. A squad of U.S. Army Rangers storm the room. Curtis, having injected the G-virus, mutates. The soldiers fire at him, and Curtis starts killing them. Leon saves Angela from the massacre as the garden begins to fall apart, with wreckage crushing Curtis. Believing him to be dead, the surviving soldiers head up the elevator to safety, Leon and Angela choosing to stay downstairs and wait for the elevator to come back down. Curtis gets out of the wreckage and mutates further, climbing up the building and killing the soldiers by destroying the elevator. The building is then set on fire by the WilPharma computer system in an attempt to avoid the t- and G-Virus' spreading. Angela and Leon jump into a pool of water to avoid burning wreckage. After having shot a glass partition to avoid drowning, the two then find themselves in an underground area. Meanwhile, Claire makes it to the command center, doing whatever she can to halt a biohazard alarm and open the building. She fails and the detection of Curtis in the underground center causes another alarm. This time, parts of the building will be ejected underground. As Leon and Angela search for an escape route, Curtis attacks them, seeing Leon as a threat and Angela as a mate. Eventually, Curtis manages to regain control, telling Angela to run. As the sections are being ejected, Leon and Angela climb up wreckage. Almost free from the drop, Curtis grabs hold of Angela. About to fall, Leon shoots Curtis in the face, causing him to fall to his death. Leon, Angela and Claire exit the building where Claire accuses Senator Davis of the cover up and the Harvardville Airport incident. Leon reveals that Davis did not know anything, and Claire realizes that the real villain was actually Downing, who caused the outbreak in the airport, the disaster on the plane, the destruction of the vaccine, the detonation of the bomb at the reasearch building and the bio-terrorism incidents by selling t-virus samples. Waiting for a contact to sell WilPharma information to, Downing mistakes a car containing Leon and Claire for his contact. He is arrested by Angela. The next day Leon and Claire meet with a despondent Angela. Leon reveals that Downing confessed to everything, which was designed as a sales pitch for the virus to General Grandé. He reveals that he was an Umbrella researcher and stole samples of both viruses and escaped immediately prior to the Raccoon City incident before erasing his history and creating a new identity with which to apply to WilPharma. Once there, he was able to sell the virus to a list of potential customers while researching the vaccine. Leon and Claire say goodbye and leave. Meanwhile, news gets out that Davis has resigned from office over allegations of insider stock trading with WilPharma stocks. A newspaper draped over Davis' face reads "Tricell Offers to Purchase WilPharma". Davis' hand falls from the desk revealing him to be dead, and on his computer WilPharma files are being deleted, which when completed reveal a Tricell insignia on his screen. The film ends with Tricell employees in hazmat suits searching the underground ruins of the WilPharma research building, where they discover a fragment of Curtis's body infected with the G-virus, which they seal in a bio-hazard container.